Click here for Dani's section. 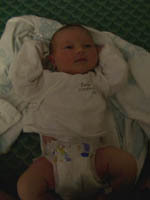 Dani was born Friday night, 9/20/02 at 10:40pm. We are so happy, click here to see updated pictures of her. I hope you enjoy the site. Click here to send us an email. I'll be periodically updating and adding pitures and information so if something isn't here now, it will be so keep your pants on. If you have pictures, info or especially jokes, send them along and I'll post them when I get a chance.